WhatsApp users on smartphones running Windows Phone OS are usually the last in line to receive new features. In fact, most features available on iOS and Android do not arrive on Windows Phone. But nevertheless, every new feature even if late is welcomed. 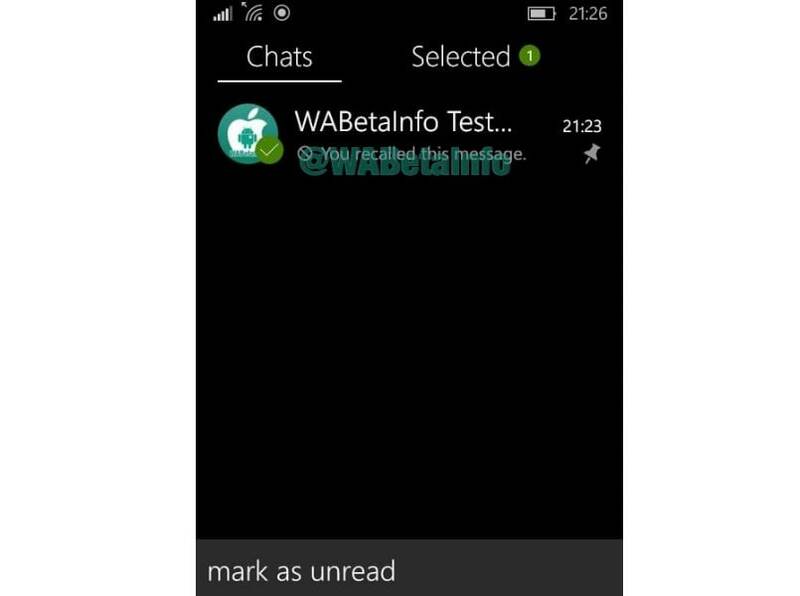 Two new features have been spotted on the new update for WhatsApp beta on Windows Phone. The new update is version 2.17.218 and has been rolled out to WhatsApp beta which is available for download on Windows Store. The two new features include selecting multiple chats and the recall button. Shared by WABetaInfo, WhatsApp had been working on the feature that allows users to select multiple chats. On the latest update, this feature has been refined and has a better layout. After selecting multiple chats, users will be able to perform actions like pin/unpin chats and mute/enable notifications. This feature is already available on iOS and Android platforms. The other feature is ‘Recall’ which essentially allows users to delete a message after it’s sent. Users will be able to edit recent messages sent on WhatsApp and not the old ones. WhatsApp for Windows Phone has added a new ‘Learn more’ button which explains how the feature works along with FAQs. It is speculated this could be hinting on the recall feature coming to Windows Phone. It had been rumored for quite some time now that the recall feature would be arriving on WhatsApp. There had been sightings on the beta version of WhatsApp working on the recall button. It is reported that WhatsApp could finally be rolling out this feature and iOS, Android users will most likely receive it first. WhatsApp had recently added a new ‘Night Mode’ feature which has been rolled out to iOS and Android users. This feature can be found on the in-app camera for WhatsApp and is meant to improve low-light photography. It is placed just next to the flash icon in the shape of a crescent moon and appears when the background has poor lighting. Current time: 04-23-2019, 12:21 AM Powered By MyBB, © 2002-2019 MyBB Group.